GENERAL SULTAN'S HQ., NORTH BURMA - Chinese troops of Lt. Gen. Dan I. Sultan's Northern Combat Area Command were about 22 miles from the Burma Road railhead of Lashio, biggest Japanese base in Eastern Burma, and were converging in two columns on the terminus this week. Troops of the Chinese 50th Division of Maj. Gen. Pan Yue-kun had driven across the Nam Tu River, after capturing the town of the same name, 25 miles to the northwest of Lashio. Lt. Gen. Sun Li-jen's First Chinese Army units had wiped out other enemy elements trying to make a stand in the hills near the Burma Road, the same distance to the northest of the city. Following the fall of Nam Tu leading elements of the 59th Division pushed south as First Army units advanced south along the Burma Road against what was described as patrol resistance. Earlier in the week, Sun's men captured Hsenwi, Burma Road town. The Chinese had to clear the town of the delaying force left behind by the Nips. American tanks spearheaded the Chinese advance into Hsenwi. The fall of Hsenwi meant that the Chinese, in conjunction with the Mars Task Force of Brig. Gen. John P. Willey, had cleared more than two-thirds of the Burma Road south from the junction with the Ledo Road. Before the 50th Division captured Nam Tu, they seized the rich Bawdin Mines, depositories of silver and lead. No serious damage had been done to the mines by the Japs before withdrawing. Advances by the British 36th Division of Maj. Gen. Francis W. Festing were also reported in the Mongwit area, with B-25's of the 490th Squadron giving air support. HQ., EASTERN AIR COMMAND - Japanese troops and stores in the Mandalay area were fiercely bombarded by Eastern Air Command heavies this week as Allied armies closed in on the city. The attacks by Maj. Gen. George E. Stratemeyer's aircraft were aimed at the enemy's store dumps south of Mandalay, at his defensive positions facing our troops and all along his lines of communication. Over 1,000 tons of explosives were dropped on stores alone, while other EAC Libs and U.S. B-24's rained 750 tons on Singaingmyo, Myittha and Kaunghmudaw. In support of the ground forces, EAC Spitfires and Hurricane bombers destroyed 13 Nip tanks while other fighters and bombers of EAC blasted continuously at enemy gun positions and troop concentrations. The Japs supply lines have been constantly harried and disrupted throughout the week. The attack on enemy bridges in Burma and Siam continued with B-24's of the U.S. Seventh Bomb Group knocking out an estimated six. Other bombers destroyed two bridges on the Moulmein-Ye rail line and three others on the Burma-Siam line. This relentless attack on Nip communications and transportation facilities accounted for numerous other bridges during the week. 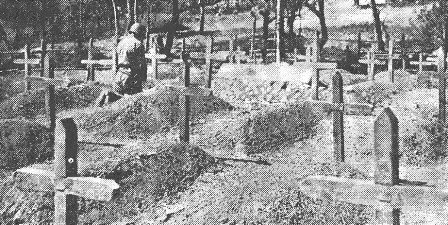 An American soldier of the Mars Task Force visits the grave of his buddy, killed during the battle which cleared the Ledo-Burma Road territory, making possible the opening of the supply lifeline to China by American and Chinese Engineers. BURMA - The valley is quiet once again. Fog rolls from the floor of the terraced paddy fields and the sun breaks through, revealing a large sign, "Soldiers Working As Usual." As you look down into the valley you see mule skinners moving along well beaten trails that the Burmese have used for centuries. You can hear them shouting and raising hell with their stubborn mules. They curse the mules day and night, but that is the language a mule understands, and the talk that brought many of the Mars Task Force safely through battle. The Burma Road is in sight when you climb to the top of the highest mountain, but who wants to climb those steep, 5,000-foot hills again. They are in the valley now, with no rations, no water, no ammunition to carry up the slopes, and if there is long marching ahead of the type that preceeded their entance into the valley, rest is what they need. Look closer, the mule skinners' faces have sobered. They are passing an American flag. Follow the flagpole down to the ground and you will see a sign. One of the mule skinners stops, ties his mule to a tree, climbs over the bamboo fence surrounding the cemetery and kneels down beside a grave. A dog tag is nailed to the cross at the head of the grave. He stands up, leaving the grave and moves on with his mule, with thoughts of his dead comrade in his mind. They had been together in the same outfit and then they were together in the Mars Task Force. He had fought side by side with his comrade at Myitkyina and in other engagements, and now he was gone. He had been killed when he moved up with his platoon, led by a platoon sergeant who had received a direct commission in the field. He was hit in the head by a Namboo light machine gun, and he died instantly. The mule skinner's mind wandered back to his comrade's cross and then to the rest of the crosses in the cemetery. He had been upon the hill the day after the attack and saw many dead Japs. He smiles a little, I think, for he knew there were seven times as many dead Japs on the hill as there were crosses in the cemetery. BURMA - The 14th Army has joined its bridgeheads at Singu and Thabeikkyin into one solid base of operations for a 40 mile drive on Mandalay. The British had to clear the Japanese from a 20 mile stretch of the east bank of the Irrawaddy River north of Mandalay to join their bridgeheads. Other units have slashed across the Irrawaddy 92 miles southwest of Mandalay and captured the ancient city of Pagan after a short, bitter fight. Pagan, one of the wonders of the East, is known throughout the world for its 5,000 glittering pagodas. The new British bridgehead, on the south bank of the Irrawaddy opposite Myininu, threatens to outflank Mandalay from the south and west. The British earlier captured the villages of Althaung and Talinyon. CALCUTTA - Ordnance installations of Base Section 2 recently have been commended for bettering vehicle maintenance records set by units in the States, in spite of lack of supplies, personnel shortages, and operating conditions in the India-Burma Theater. Three percent of the vehicles of ordnance installations in the States were deadlined for more than three days, while Base Section 2 set a record of only 2.7 percent in a recent month, it was announced by Col. James D. Barnett of San Antonio, Tex., base ordnance officer. Barnett praised the drivers of the vehicles and unit mechanics as "the most important links in the maintenance chain." An intensive program of automotive maintenance was instituted early in 1944 with schools, competitions and stepped-up supervision, and with the cooperation of drivers and mechanics it is hoped that this record can be bettered in the future, said Barnett. CALCUTTA - Col. W.C. Kinsolving, District Engineer of SOS received a message over the wire recently that gave him some first hand information of the pipeline project. The report was a little unorthodox, but Kinsolving decided to file it under the heading of wild animal life. The wire read as follows: "Wild elephant at Station 21 this morning went through an Indian basha, took a S/C trailer and threw it up into the air, wrecking it completely, then tore down a four-foot fence, then a seven-foot fence and then was killed by one shot from an .03 rifle. A conference is now being held as to disposal of remains, ant suggestion greatly appreciated. No other casualties. Further report on wild animals. Night before last at Station 22 a tiger tore down door in kitchen and consumed all meat and non-canned food. Responsibility of operating pipeline in Assam beginning to assume angles not taught in P/L school. For you information a soldier recently mauled by a tiger at Station 16 is doing nicely. Request necessary authority to hunt down animals. - Capt. Shefts." Chinese Confab Breaks Down; Hurley in U.S.
CHUNGKING - The simultaneous departure from Chungking of U.S. Ambassador Maj. Gen. Patrick J. Hurley and Communist leader Chou En-lai caused speculation this week that the "Hurley Mission" failed to bring the Government and the Communists together. Hurley is en route to the States to report to the President and although the embassy described his visit as a "short trip home," it was generally believed he would not return. Chou has returned to the Communist headquarters at Yenan. Information Minister Wang Shih-chieh announced that negotiations between the Chungking and Chinese Communist governments had broken down because the latter had rejected a number of government concessions, including a promise to give legal status to the party and inclusion of party representatives on the National Military Council and the executive Yuan. The Communist version of the breakdown differed widely from the Wang report. It said the discussions had been snagged by the refusal of the Chungking government to grant any real measure of power or a voice in the government. The chief Communist demand is for curatilment of the power of Chiang Kai-shek in favor of an organization similar to the U.S. Congress which would be the nation's highest authority. 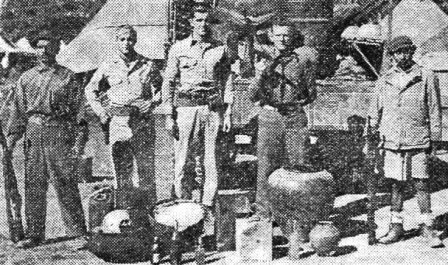 Flanked by two Kachin guards are three members of the 10th Air Force's raiding "revenoors," who have just returned from a saki raid. To the back and front is part of the haul of potent brew and ingredients. HQ., 10TH AIR FORCE, BURMA - The Military Police of the 10th Air Force have an eye to the future. After reading Women's Christian Temperance Union propaganda about the horrors of drink, the MP's could forsee the day when prohibition agents would again be living on the fat of the land in the U.S. So they boys decided to do a little conditioning for their potential occupation. Saki, strong enough to make a minister's son go to church, had long been a sore spot with brass hats. It was bad enough when the inebriates couldn't remember their serial number, but when they couldn't even remember they were in Burma it proved the saki had a new low in potency. The MPs began raiding Burmese stills. Assisted by the British Civil Police, the G.I. coppers collected more than a truckload of saki and ingredients used in making the brew. The finger man for the flat feet was one Pvt. Thomas W. Laureno, who used to spot the joints around Staten Island in civilian life. Laureno would visit the various Burmese hot spots and ask to buy a drink. If he were able to get some saki, he later returned with a party of raiding police to confiscate the still. Veteran drinkers, who had tasted saki at one time or another, paled at the fixings. The ingredients, kerosene and rice, are allowed toferment and are drained and bottled. INDIA-BURMA THEATER - Probably the most distinguished plane in the India-Burma Theater, the B-25 camouflaged by the signatures of its builders and bond buyers in the United States, has now completed 46 missions, but not without some bruises. On its 40th mission for the 12th Bomb Group it came limping home on one engine for the last 50 miles, with 19 holes in its fuselage. the target for that day was enemy positions at Pynimana. Before leaving the target the plane bombed out one end of the road bridge, set afire two bashas with strafing and tore up a section of rail track north of the bridge. A corporal turret gunner was the only casualty. He received a flesh wound on his hand from a piece of flying shrapnel. Lt. Robert B. Allen of Sherman, Tex., was the pilot of the plane. SEVENTH BOMB GROUP - The Shepherd brothers of Philadelphia had a reunion here after 17 months of separation. Eric, a corporal, is a maintenance man with the Seventh, while Ronald is a lieutenant with the 14th Air Force in China. Ronald flew here from a rest camp in India. HQ., 10TH AIR FORCE IN BURMA - A brand new "200 Club" composed of veteran 10th Air Force fighter pilots operating over the Jap-held sectors of Burma, is as hard to koin as the famed "400" of New York society and decidely more robust. Membership requirements are tough: to belong, a pilot must have flown 200 or more combat missions. Up to now, only 12 men have complied with the requirements, and of these nine are still flying against the Japs in Burma. Led by Capt Charles F. heil, Mt. Emphraim, N.J., flight commander for a squadron of the 80th Fighter Group, and Maj. Morgan S. Tyler, Santa Monica, Calif., both with more than 235 missions, the current membership includes Lt. Col. Stanton T. Smith of San Antonio, Tex. ; Major Robert W. Rowntree, Kansasville, Wis.; Major Richard M. Powell, Minneapolis, Minn.; Capt. Felix H. Jones, Birmingham, Ala.; Lt. Tony N. Jewell, Dayton, Tenn.; Lt. Merlie A. Johnson, Atlanta, Ga. and Lt. John Maker of New York City. All the members, with the exception of Tyler, who is commanding officer of the "Fighting Crow" squadron of the "Terry and the Pirates" group, are members of the 80th Fighter Group. The nine members of the club who are still flying against the Jap in Burma have flown a total of 1,942 combat missions, 4,770 combat hours, and have dropped more than 600 tons of bombs. "Backing the attack" for the pilots are crew chiefs, ordnance, armament, engineering, and radio ground crews, who have averaged almost 13 hours work a day in the past 17 months to keep the planes ready and loaded, and to keep pace with the demands for targets to be destroyed. CALCUTTA - A new record of 57 hours, 57 minutes for the trip from Miami to Calcutta was set this week by Lt. Col. Robert Forman of the Air Transport Command's India-China Division. Forman's actual flying time in delivering the new C-54 to East Bengal was 46 hours, 45 minutes. FORWARD HQ., MARS TASK FORCE - A tall, husky GI, with a black, fiercely-curled moustache, came walking down the trail from the Mars Task Force perimeter. He needed a shave. His fatigues showed contact with the red earth of a foxhole. A Tommy gun was slung over his shoulder. "Any luck today?" asked a pack trooper moving up to the lines with a Missouri mule ambling behind him on a halter rope. "Nope." "Why don't you give up, John? You'll never find those rats in the daytime. You stick to your cooking, we'll take care of the Jap," needled the trooper as he slogged ahead, tugging at the mule's halter. The mule flicked an ear, then moved forward where American artillery was exploding on Jap positions. "Look son," said the GI with the Tommy gun, "I promised myself a Jap. I'll get one even if I have to come back at night to do it." He shifted the gun to his left shoulder and moved along toward the regimental CP, on the lee side of a hill in the Hosi Valley. I ran into him a few hours later when I returned to the 124th Cavalry Regiment CP, for evening chow. He had shaved and was wearing clean fatigues, washed in a brook not far from the CP. He was dishing out chow from a fire-blackened five gallon tin can, and kidding with the men as they moved down the line toward the coffee can and preserves. The black-moustached cook who goes hunting for Japs when he isn't busy preparing chow for the regimental CP is S/Sgt. John Belt of Cincinnati, O., former chef of the Sherry Netherlands Hotel in Cincinnati, the Booke-Cadillac in Detroit, and Manhattan's New Yorker Hotel. He gave up cooking about nine years ago and concentrated on the banquet and catering end of things, ended up running a supper club in Los Angeles. When the Army caught up with him he put on the chef's apron again and cooked for the brass hats at the Desert Training Center at Indio, Calif.
"This is a little different than cooking for the brass," said Belt as he deftly flipped spoonfuls of tinned meat into the beltline of moving messkits. "I had two Chinese helpers at Indio - the general was a sucker for fancy oriental dishes, so I dug up some Chinese boys who used to work fo me in L.A., and put them to work in the kitchen. They were both in the Army by this time. "We used to turn out dishes that weren't in the books. When I was assigned to the 124th the Chinese boys came along with me, but after we got to Burma one of them went crazy - got out on a Section Eight. I should be that crazy. Don't know what happened to the other one." The chow line petered out. Belt emptied out the cans and cleaned-up the leftovers. "The boys are eating pretty good the past few days," he said. "The airdrops are more regular now and they're getting plenty of chow. But we were really hurting for a while on that march from Myitkyina. There were times when the planes couldn't make contact with us and then the guys really had to go easy." "A couple of times we did a two-day march on one day's rations. We jumped off against the Japs here on empty stomachs. Didn't get an airdrop for two days and most of them didn't eat until they got to the objective. Then they ate Jap biscuits and rice. After that the airdrops started and we've been doing okay ever since. Pretty fancy having a chowline right up at the front, isn't it?" He grinned as he wiped his hands a lit a cigarette. "It's a funny thing about those goddamn Japs," he said. "I've been going up to the perimeter every afternoon with that damn Tommy gun. I make myself comfortable in a foxhole and then I start to look over the terrain. I work back and forth until until I'm nearly cockeyed, and I never see one of them. Then I come back here and the same night the little bastards break out of concealment not forty yards from where I was in the afternoon. And somebody else knocks them off. Then I start all over again the next day. "I think I'll go up some night for a couple of hours. Maybe I'll have some luck in the dark. It's a good change from cooking all the time." He slung the Tommy gun over his shoulder and moved off toward his foxhole. NEW YORK - Leonard Lyons, Broadway columnist for the Post here, had this to say in a recent column. 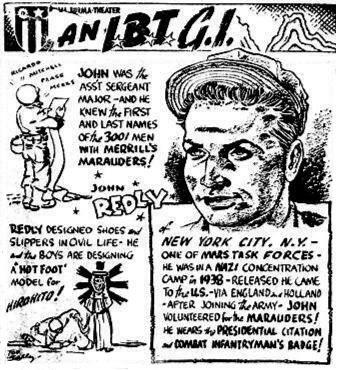 It seems that Signal Corps photographer Joe Abeles, who was a noted theatrical photographer before the war and who is now stationed in Karachi, recently was on a cross-India tour. He stopped at a crowded Indian shop with his pilot at one of the towns they were working in, and the proprietor's young son asked the pilot in English were he was from. "Chicago," answered the pilot. "A gangster," said the boy. Abeles said he came from Brooklyn. "A bum," answered the boy. LEWISTON, IDAHO - William C. Borland, 44, who took to the hills when President Roosevelt was elected in 1932 and stayed there ever since was in jail this week charged with draft evasion and stealing from forest rangers whom he had led aon a merry chase before they finally trapped him. He said, "I went into the hills when Roosevelt beat Hoover and the Federals have been after me ever since for borrowing clothes and stuff from ranger stations." Surprised to hear there was a war on, he asked, "Who got us into that?" His diet of berries and game ruined his teeth and he finally pulled all the lowers with wire. He said he eleuded rangers by walking backwards on snowshoes or using an extra pair on poles to leave reversed tracks. Original issue of India-Burma Theater Roundup shared by CBI veteran Howard Sherman.